At Hannam University we consider our initiative of "HNU to the world, the world to HNU" as an honor and a privilege. Our university recognizes the value of each individual student, and it is the goal of our faculty to unlock the potential that lies in each of us. The university's mission is focused on quality education and preparation for competent leaders in a changing world. 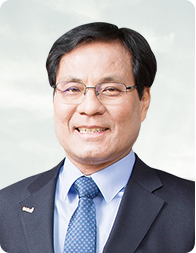 Since its foundation, Hannam has grown in size to become a major scientific and educational force in the region and the country-and we're still growing. Hannam has also served as a gateway of active international partnership and abundant exchange between Korea and the rest of the world. The entire faculty and staff are the bearers of its commitment to produce the global elite that will serve the country and the world. Hannam was founded by Christian missionaries after the Korean War. These amazing forefathers sacrificed to pioneer the very avenues that you will experience at our beautiful campus in Daejeon. This frontier spirit serves as an undergirding foundation in the fruitful international partnerships which create opportunities for students to choose the country, school, and program which is most appropriate and fulfilling for their intellectual, emotional, social, and spiritual growth. On the basis of this legacy, Hannam has been taking the lead in fostering Christian higher education in Korea; it is consistently recognized as one of Asia's best Christian universities. If you wish to study abroad at Hannam, we have the appropriate program and people to fit your needs and desires. We are active and effective partners with our network of sister schools around the globe and we are eager to help you find some of the life changing experiences that so many others have discovered through taking part in international education. We encourage you to continue striving for the standards of academic excellence we maintain here at HNU. As a vital component of our global initiative, we invite you to take advantage in the multicultural opportunities that are provided by HNUCIR. Accept the challenge of continuing to broaden your mind and experience a new side of life and education through our study abroad programs which will challenge you into stretching your holistic being. I wholeheartedly recommend for you to come to Hannam University where I will be excited to hear of your adventures on our campus, in Korea, and around the world. The primary goal of Hannam University is to educate competent leaders who will serve their nation and their church based on Christian principles. Students are required to follow a very strict curriculum in order to gain new knowledge and skills so that they will make faithful leaders equipped with intellect and virtue in compliance with the guidelines of the Ministry of Education. Hannam aims to contribute to the church and the nation by producing well-rounded intellectuals with high moral values. The University offers a wide range of opportunities to acquire insight and knowledge through the Christian spirit of truth, freedom and service.